HCM City People’s Committee has just decided to invest in expanding the road from Rach Chiec Bridge on the East Ring Road to far Hanoi, rebuilding the water supply pipe and the Van District 9 tunnel. According to the proposal of the Department of Transportation, the HCM City People’s Committee approved the allocation of budget capital Ho Chi Minh City to carry out site clearance work for the construction of the first section from the Rach Chiec bridge on the East Ring to Ha Noi Highway, including Binh Thai traffic junction and section 2 from Binh Thai intersection to Pham Van Dong road belonging to Ring Road 2 of Ho Chi Minh City. Ho Chi Minh City People’s Committee also assigned Ha Noi Highway Investment and Construction Joint Stock Company to deploy water supply works in the form of relocation, re-establishment of the water supply pipeline and tunnel under the underground tunnel works. Traffic Station 2, District 9 under the project of expanding Hanoi Highway. The Saigon Water Supply Company should agree on the technical options, design elements, technical standards in the relocation dossier, supervise the implementation work so as to ensure the technical requirements of safe water supply pipelines in exploitation and operation. To organize the review of water supply pipelines and related projects within this work area so as to work out synchronous construction plans and avoid further excavation after the works are completed and put into use. 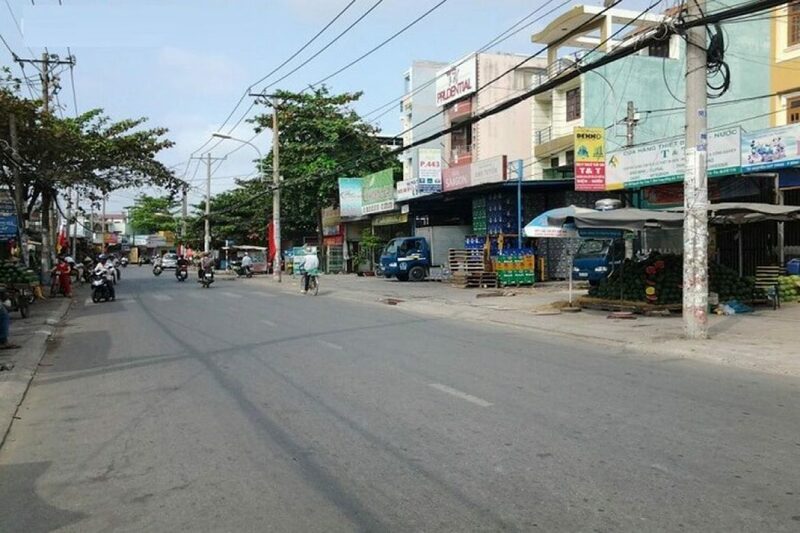 In addition, Ho Chi Minh City People’s Committee approved the coefficient of adjustment of land price to calculate the compensation and support of the project to expand and upgrade Nguyen Tu Nghiem Street, Binh Trung Tay Ward, District 2 is 4.49 and land Agriculture is 26.31. At the same time, the land price adjustment coefficient in Special Use Road 9 was used to calculate the compensation and support of flood-affected projects in the Ho Chi Minh City area considering climate change factor 1 In Phu My Ward, District 7 is 12,166. The HCM City People’s Committee has also approved the Hi-Tech Park Management Board to carry out the program of hi-tech agricultural development cooperation with three districts of Cu Chi, Binh Chanh and Can Gio in 2018. .
Before that, Ho Chi Minh City has proposed the Prime Minister to consider and approve the selection of investors in special cases including the transport projects need to urgently reduce the congestion in the area. The city gateway is often a junction that affects the socio-economic development of both the city and the surrounding area. After these projects are implemented, the 69-km Ring Road 2 will be closed with the following routes: Gò Dưa Bridge crossing (Highway 1, Thu Duc District) – Bridge intersection An Phuong intersection (connecting with National Highway 13) – An Suong intersection (intersection with National Road 22) – An Lap junction (Highway 1 intersection with Ho Ngoc Lam road) – Phu Dinh – Nguyen Van Linh – Phu My Bridge – Rach Chiec Bridge on the East Ring Road – Binh Thai Crossroad (on Hanoi Highway) – Linh Dong Crossroad (intersection with Pham Van Dong Street) – Go Dua Interchange ..
Ho Chi Minh City has just decided to revive Rach Chiec Sports Complex in the center of East (District 2) with a total investment capital of VND 34,000 billion and 500ha. Along with that, a bridge project with total investment of VND500 billion on the newly opened Saigon River will help connect Thanh My Loi, Cat Lai and District 2 to the city center. In addition, there will be 4 bridges built (bridges 5, 9, 12 and N4) at the project of constructing technical infrastructure of the Northern residential area and To complete the North-South backbone road in Thu Thiem new urban area. 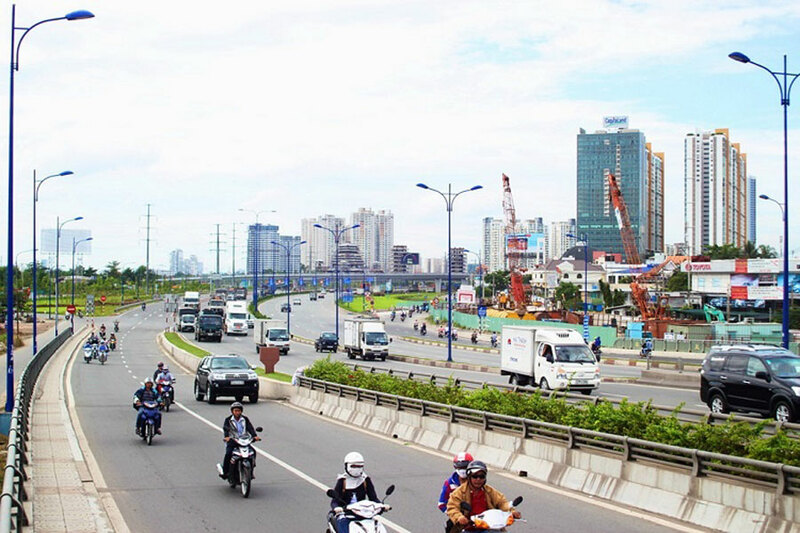 Ho Chi Minh City People’s Committee also decided to invest in expanding the To Ngoc Van road to 30m straight from the Hanoi Highway to Pham Van Dong Boulevard (Thu Duc). In the third quarter of this year, the Urban Transport Management No.2 Department of Transport of Ho Chi Minh City will carry out the project to upgrade and expand Do Xuan Hop Road (section passing through District 2 and District 9). 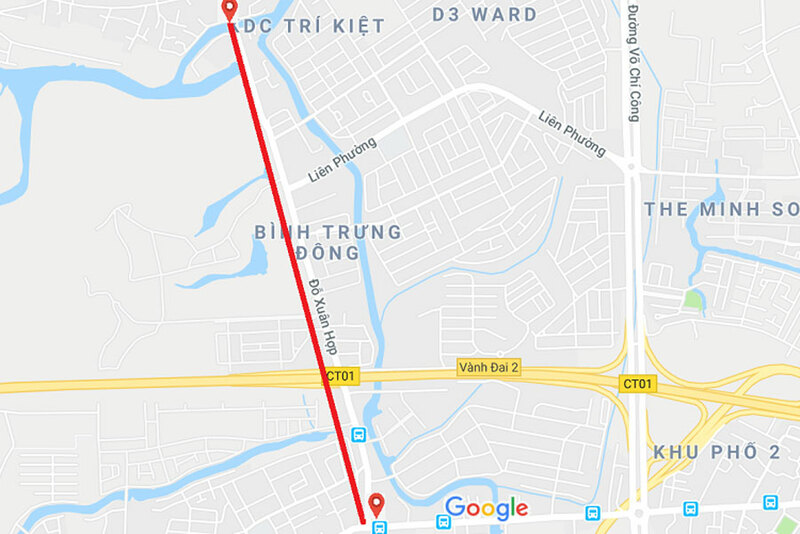 Accordingly, Do Xuan Hop road from Nguyen Ly bridge to Nguyen Duy Trinh road with a length of 1.79 km was extended to 30m (including 8m sidewalks on both sides) for 6 lanes of traffic. Beside the road extension, the Urban Traffic Management No.2 will install additional drainage system, green tree planting and lighting system. Total investment of this project is VND390 billion, expected will be completed by 2021. It is known that Do Xuan Hop is an important transport link connecting means from Ha Noi Highway through Nguyen Duy Trinh to Cat Lai Port. Over time, this route is degraded and often congested due to the large volume of traffic. According to the record, along Do Xuan Hop street, there have been many real estate projects in the segment of apartment, townhouse and villas of many big investors such as Khang Dien, Novaland, Nam Long. In the future, when the extended Do Xuan Hop road has been put into use, people living in the neighborhoods, villas, apartments nearby such as LakeView City, Gem Riverside, The Venica, Jamila Khang Dien, Valora , Fuji, EhomeS, Cherry Blossom … will easily move to the city center. In addition, with the expansion of this route, surely the potential increase of the sale price of this series of projects is feasible, opening up great investment opportunities for real estate investors. You are reading the article Ho Chi Minh City approves to invest 3 more infrastructure projects in the East in the Real Estate category at https://realestatevietnam.com.vn/. Any information sharing, feedback please contact through Hotline 0909890897 (24/7) or email to info@realestatevietnam.com.vn.